Sometimes, canine anxiety can result in canine aggression. If a dog is frightened, he/she may lash out. Other times, anxiety may result in a timid dog that is afraid of his/her own shadow. Neither is an ideal situation. My latest anxiety case was a young dog named Chelsea. Her owner called because she was barking, nipping, eating her own feces, and too shy to even walk on the leash. As with every new client, I performed an in-home consultation to get to know the owner and pet a bit better and to hopefully observe some of the problem behavior for myself. Having a stranger in her house made Chelsea frantic, and she barked, peed in the house, and refused to calm down even after an hour of my being there. This type of reaction to the unknown creates a stressful environment for the both the dog and the owner. It needed to be fixed as soon as possible so they could get back to enjoying one another’s company again. I created and in-home training plan that involved crate training, basic obedience training, proper leash handling techniques, and consistent scheduling. 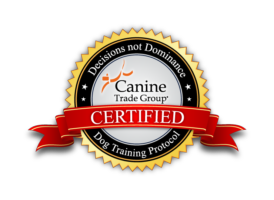 Oftentimes, the owner learns more during the training process than the dog does, as owner involvement and communication skills are paramount to the dog’s success. After all, once my work is done, the owner needs to know how to ensure the behavior doesn’t relapse. Chelsea’s owner did a fantastic job and really committed to the training regimen. Within a few weeks, Chelsea learned to trust in her owner’s decisions and obey his commands, which allowed them to begin going for pleasant walks and her to stay calm when he had house guests. We also eradicated the nipping and excessive barking, and by keeping Chelsea on a strict and consistent schedule, she didn’t have much of an opportunity to eat things she shouldn’t. Thanks to Chelsea’s owner and the initiative he took in calling Beltway Dog Training, Chelsea is a more relaxed housemate, and she has a much better relationship with her owner. To learn what I can do for you and your dog, give me a call at 202.318.1380.